One Analysis Technique – So Many Options! X-ray Fluorescence (XRF) solutions – which type of XRF instrument should I choose? Most of the XRF systems out there are very versatile and can be used in many different applications, but they are typically suited for a specific type of analysis. Since the discovery of XRF many decades ago there have been new developments and new instruments just about every year. The term Florescence is applied to phenomena in which the absorption of radiation of a specific energy results in the re-emission of radiation of a different energy. There are two different types of detectors for XRF systems: Wavelength Dispersive (WDS) and Energy Dispersive (EDS). 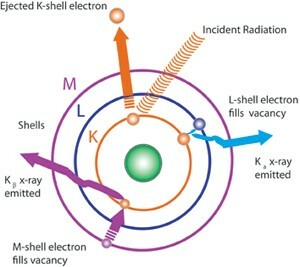 In energy dispersive analysis, the fluorescent X-rays emitted by the material sample are directed into a solid-state detector which produces a “continuous” distribution of pulses, the voltages of which are proportional to the incoming photon energies. This signal is processed by a multichannel analyzer (MCA) which produces an accumulating energy spectrum that can be processed to obtain analytical data. In the XRF world there are many different types of instruments to choose from: large systems to small systems; high powered systems to low powered systems, floor standing systems to benchtop to portable systems. What do I choose, where do I start? The answer to these questions is that it really depends on the samples you are trying to measure and the performance you are trying to achieve. I really classify these instruments in 3 different categories: bulk, portable, and small spot. Bulk XRF: This typically means that you have samples that are either powders, liquids or even solids that you need to analyze quickly. Bulk instruments have a large x-ray spot size to excite a lot of the elements fast and get a quick answer. They can be EDS or WDS instruments, benchtop or floor standing, and low or high power. The kind of analyzer will determine what you can or cannot measure. The higher the power, the lighter the elements and the lower the concentrations. The benchtops typically are lower power (50kv and lower) and are usually decent for go/no go type analysis and even everyday type of analysis when super low LOD’s are not needed, or light elements (below Na) are not of a concern. If you need lighter elements or lower LOD’s then typically you would go with a high power WDS system and these typically can go up to 4kw of power and have a vacuum chamber or He environment . Portable XRF: This is just what is says – portable. These analyzers are typically used for sorting metals, in the geological field, or anything that you can’t just bring to the lab. The performance of these have come a long way and they are a critical tool for many industries. They tend to have a larger spot size but since they are portable they must be light to carry around all day. They are typically lower power and lower current, which does not allow them to have the same type of performance as the lab type instruments but usually they are good for sorting and identifying samples. They are also very good for ancient artifacts or paintings that can’t be brought to a lab. μXRF (Micro spot XRF): These are the instruments that have a small spot size compared to all other XRF systems and they are used in smaller sample identification or mapping of a sample. There are several different types of μXRF analyzers. Some use collimators to focus the beam (this typically loses intensity) for applications like coating thickness testing or alloy id. These are usually designed to be inexpensive and benchtop for quality control applications. They are versatile but also limited to the elements they can measure. Most of these only analyze down to Potassium as they usually do the analysis in an air environment. 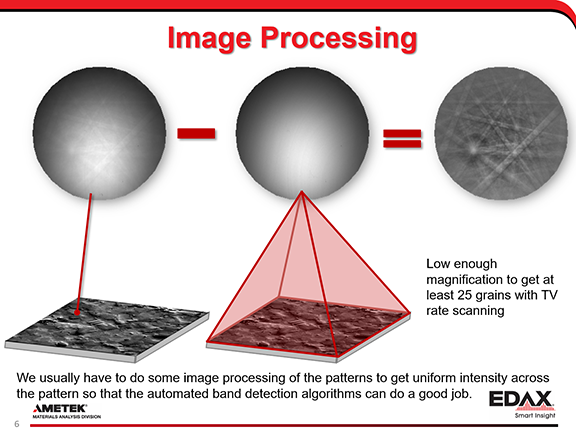 Then there are μXRF systems that use optics to focus the x-ray to smaller spot sizes. These are used for more in-depth analysis, and are equipped with a vacuum chamber, mapping and low LODs. Before buying an XRF system many factors must be taken into consideration and you need to ask yourself some of the following questions to really determine the best fit for your applications. • How big is my sample? • Can I destroy my sample? 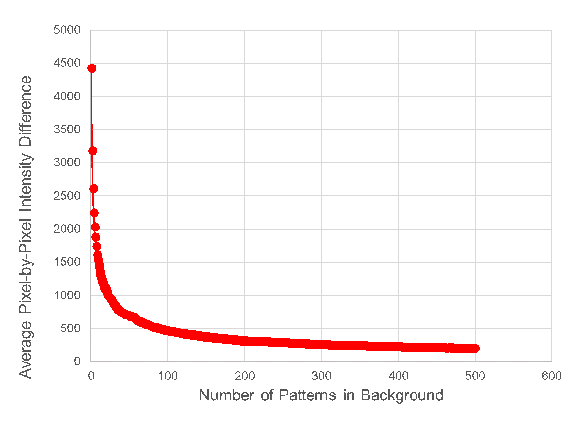 • What levels of detection do I need to measure? • How many samples per day will I measure? • Can I pull a vacuum with my sample? • What elements do I need to measure? • What type of flexibility do I need for multiple sample types? • What size features or samples do I need to measure? • How much money do I have? As you can see there are many questions to answer and many options for XRF instruments. The more you know about what you want to measure, the better you can narrow down your search for the proper instrument. XRF is a very powerful technique but you do need to get the proper tool for the job. A few weeks ago, I participated in a joint SEM – in-situ analysis workshop in Fuveau, France with Tescan electron microscopes and Newtec (supplier of the heating-tensile stage). One of the activities during this workshop was to perform a live in-situ tensile experiment with simultaneous EBSD data collection to illustrate the capabilities of all the systems involved. In-situ measurements are a great way to track material changes during the course of an experiment, but of course in order to be able to show what happens during such an example deformation experiment you need a suitable sample. For the workshop we decided to use a “simple” 304L austenitic stainless-steel material (figure 1) that would nicely show the effects of the stretching. Figure 1. Laser cut 304L stainless steel tensile test specimen provided by Newtec. I was hoping to get a recrystallized microstructure with large grains and clear twin lamellae such that any deformation structures that would develop would be clearly visible. What I got was a sample that appeared heavily deformed even after careful polishing (figure 2). Figure 2. BSE image after initial mechanical polishing. This was worrying as the existing deformation structures could obscure the results from the in-situ stretching. Also, I was not entirely sure that this structure was really showing the true microstructure of the austenitic sample as it showed a clear vertical alignment that extended over grain boundaries. And this is where I contacted long-time EDAX EBSD user Katja Angenendt at the MPIE in Düsseldorf for advice. Katja works in the Department of Microstructure Physics and Alloy Design and has extensive experience in preparing many different metals and alloys for EBSD analysis. From the images that I sent, Katja agreed that the visible structure was most likely introduced by the grinding and polishing that I did and she made some suggestions to remove this damaged layer. Armed with that knowledge and new hope I started fresh and polished the samples once more. And I had some success! Now there were grains visible without internal deformation and some nice clean twin lamellae (figure 3). But not everywhere. I still had lots of areas with a deformed structure and whatever I tried I could not get rid of those. Figure 3. 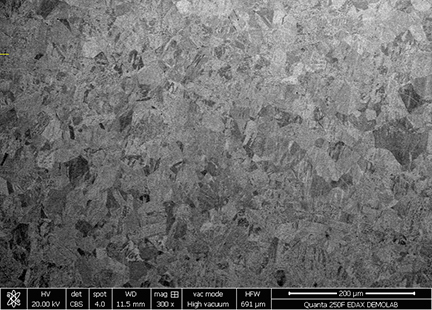 BSE image after optimized mechanical polishing. Back to Katja. When I discussed my remaining polishing problems she helpfully proposed to give it a try herself using a combination of mechanical polishing and chemical etching. But even after several polishing attempts starting from scratch and deliberately introducing scratches to verify that enough material was removed we could not completely get rid of the deformed areas. Now we slowly started to accept that this deformation was perhaps a true part of the microstructure. But how could that be if this is supposed to be a recrystallised austenitic 304L stainless steel? Table 1. 304/304L stainless steel composition. Let’s take a look at the composition. 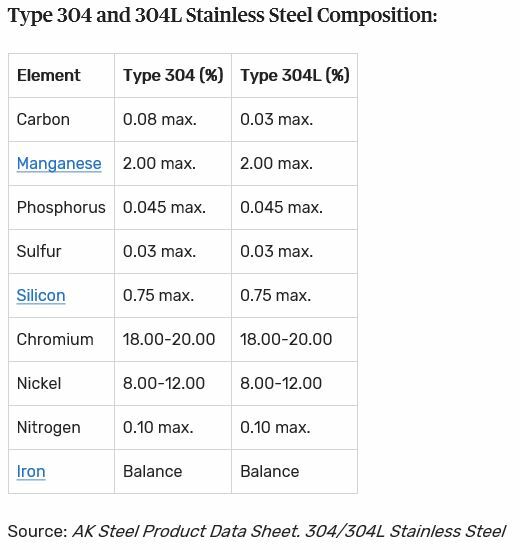 In table 1 a typical composition of 304 stainless steel is given. The spectrum below (figure 4) shows the composition of my samples. Figure 4. 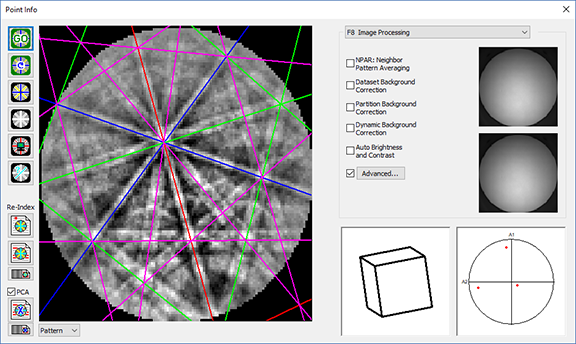 EDS spectrum with quantification results collected with an Octane Elite Plus detector. All elements are in the expected range except for Ni which is a bit low and that could bring the composition right at the edge of the austenite stability field. So perhaps the deformed areas are not austenite, but ferrite or martensite? This is quickly verified with an EBSD map and indeed the phase map below confirms the presence of a bcc phase (figure 5). Figure 5. 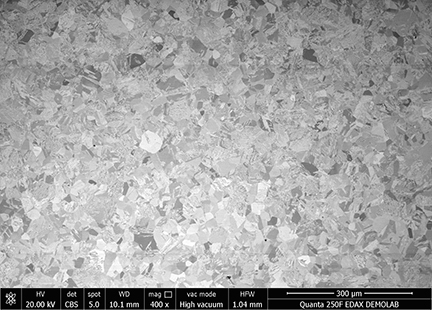 EBSD map results of the sample before the tensile test, IQ, IPF, and phase maps. Having this composition right at the edge of the austenite stability field actually added some interesting additional information to the tensile tests during the workshop. Because if the internal deformation in the austenite grains got high enough, we might just trigger a phase transformation to ferrite (or martensite) with ongoing deformation. Figure 6. Phase maps (upper row) and Grain Reference Orientation Deviation (GROD) maps (lower row) for a sequence of maps collected during the tensile test. And that is exactly what we have observed (figure 6). At the start of the experiments the ferrite fraction in the analysis field is 7.8% and with increasing deformation the ferrite fraction goes up to 11.9% at 14% strain. So, after a tough start the 304L stainless steel samples made the measurements collected during the workshop even more interesting by adding a phase transformation to the deformation. If you are regularly working with these alloys this is probably not unexpected behavior. But if you are working with many different materials you have to be aware that different types of specimen treatment, either during preparation or during experimentation, may have a large influence on your characterization results. Always be careful that you do not only see what you believe, but ensure that you can believe what you see. 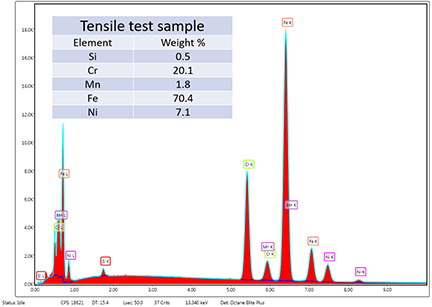 Finally I want to thank the people of Tescan and Newtec for their assistance in the data collection during the workshop in Fuveau and especially a big thank you to Katja Angenendt at the Max Planck Institute for Iron Research in Düsseldorf for helpful discussions and help in preparing the sample.